The eastern loggerhead shrike, one of the fastest-declining bird species in North America, is a unique songbird. This delicate looking bird, with its characteristic raccoon-like eye mask, hunts like a bird of prey. Using its strong, hooked beak for the kill, the eastern loggerhead shrike impales its prey, typically large insects, on thorns or the barbed wire of fences. As the shrike does not possess the strong grasping legs of a raptor, this technique allows it to tear apart and consume its prey or leave it for later consumption. 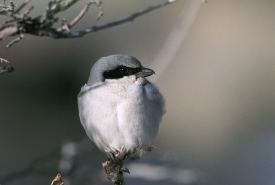 The thorn trees present on many parts of Carden Alvar are a traditional nesting area for the eastern loggerhead shrike, a species considered endangered across eastern Canada. The eastern loggerhead shrike is one of the first birds to return to Canada each spring, migrating north in April from the southern United States where it overwinters. Shrikes are a classic example of an “area-sensitive species” since, like many grassland birds, they require large areas of open terrain before they are comfortable enough to nest. 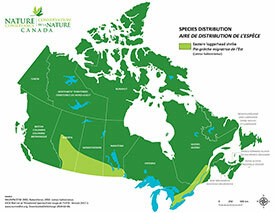 There are now only several regular breeding grounds in Canada for the eastern loggerhead shrike, in Ontario. 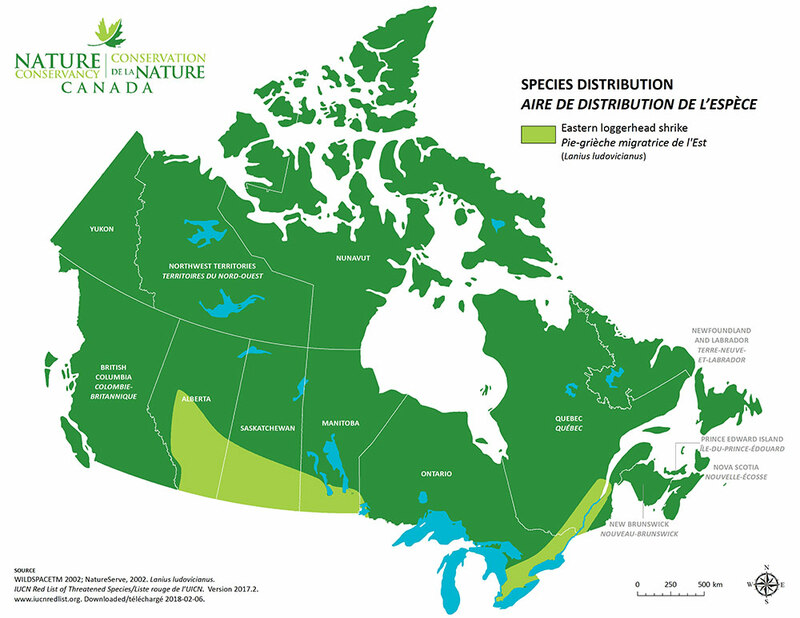 In Ontario, NCC manages properties with both known and potential eastern loggerhead shrike populations on Carden Alvar, the Rice Lake Plains, the Napanee Plain, the Scheck Nature Reserve, the Northern Bruce Peninsula and Manitoulin Island.